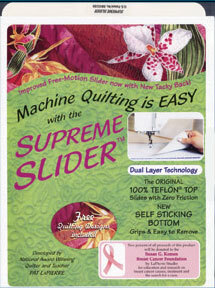 The Supreme Slider is a patented Zero Friction product that is guaranteed. Your quilt will slide like water off a duck. It makes the dreded drag disappear! Fits any machine and can be trimmed with a scissors. This Supreme Slider has the original 100% teflon top with a NEW self sticking bottom - huge improvement. It got the thumbs up from everyone at PMS that tried it.